Knowing on a deeper level the likely opening deviations and how to punish them (or at least get a better game) is key to getting a practical advantage out of your selected openings. This is closely allied to the importance of understanding your openings' concepts, not just the latest variations; in many books play may be taken simply for granted until far into the game and the GM writing the book may not bother to even mention normal-looking alternatives. Below are the chapter headings for the book with some commentary on content. Chapter 1 - Main Line: Introduction and 11. Bf4. The author chooses to start off with the 3. Nc3 main line, which is probably the most deeply analyzed historically, and selects the Classical (aka Capablanca) variation to meet it, 4...Bf5 (which I play). Houska does a good job of discussing some of the introductory concepts about the variation while fast-forwarding ahead to move 11, which in this case is legitimate; I actually have played a number of games in which White can rattle off things automatically to this point (and beyond). 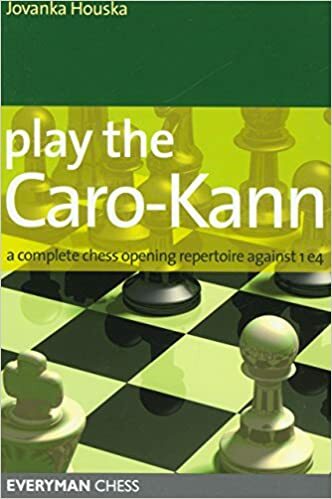 This particular chapter may not be 100% relevant to your repertoire if as a Caro-Kann player you don't play an early ...e6 instead of developing first with ...Nf6, but many of the lines transpose - it's hard to avoid playing ...Nf6 - and the various ideas are good to see in action regardless. In particular, the ideas of hitting a white pawn on c4 with ...b5 and how to handle White's attacking idea of g2-g4 are well treated. Chapter 2 - Main Line: 11 Bd2. This is really the meat of the analysis for my repertoire and the foundation of the Caro-Kann main line, so all the ideas are relevant. Knowing how to handle thematic White attacks like the sacrifices on h6, g6, f5 and e6 are very important, as is setting up Black's counterplay on the queenside and along the c-file in particular. Caro-Kann players will get a sense of the cut-and-thrust of these positions and also have their morale boosted by seeing how dangerous-looking White attacks can be foiled. In this chapter Houska also treats the early deviation 8. Bd3, in which White basically plays the same way but foregoes h4-h5, and suggests that Black go for queenside castling. Chapter 3 - Main Line: 6. Bc4 and Early Deviations. Here we find a White transposition to the Blackmar-Diemer Gambit (via 4. f3) and Houska advocates taking the pawn, which is principled but can be dangerous if you don't really know the lines. Her preference of following up with 5...Bf5 and subsequent play looks pretty straightforward for Black. Separately, the main line with 5. Nc5 (used by Fischer a few times) is treated with 5...b6 as the standard response. The various 6th move alternatives, especially 6. Bc4 and 6. N1e2, need to be studied carefully by Black players, since the ideas are different from the regular main line. 6. f4 is also a rather violent line and should be looked at, since it has good surprise value for White and Black needs to know recommended piece development (Bf8-d6, Ng8-e7). Chapters 4-5 treat the Panov-Botvinnik Attack, using the theoretically recommended 5...Nc6 line, which requires Black (especially) to really know the sequences, since the variations are sharper and White has the initiative and some lasting pressure; however, Black is fine (or sometimes better) in the end, due to better structural and positional factors. Instead I play the 5...e6 line, which is more solid and typically transposes into a position classified as a Semi-Tarrasch defense (from queen's pawn openings). Chapters 7-8 go over the Advance Variation, which at top levels has long replaced the "main line" (3. Nc3) as the most popular approach for White. Interestingly, this hasn't really happened at the Class level (at least in my experience), which means that players of both sides may be put off to some extent by the large amount of theory after 3. e5 Bf5, which is the most logical choice for Black, who places the light-square bishop outside of the pawn chain before playing ...e6. Houska instead advocates the sideline 3...c5 and does a good job of covering it in depth, which is rare in Caro-Kann literature. It is the only real gambit variation in the Caro-Kann but it is still a quite solid approach in most lines, as White usually either has to give back the pawn or is left with no real prospects for making progress. Black (as Houska advises) should concentrate on the positional compensation rather than desperately trying to recover the pawn, so it is a genuine gambit line. It's worth noting that Houska after the main theoretical continuation 4. dxc5 only presents 4...e6 for Black, which is the second most popular choice (after 4...Nc6). Both lines score about the same in the database (43% for Black). I think it's mostly a matter of taste, as the position naturally becomes more French-like after the early ...e6. Chapter 9 - Fantasy Variation. This line (with 3. f3!?) is a favorite of White players impatient with normal Caro-Kann lines who just want to attack on the kingside (similar in some respects to the approach of the Blackmar-Diemer Gambit per above). The Kenilworthian blog summarized interest in the variation back in 2010. If Black players just make mindless exchanges that leave the center wide open, then White has a nasty quick-developing attack. That said, the theoretically most critical line has Black play 3...dxe4 followed by 4...e5 (and then the e5 pawn becomes the linchpin of the position). Houska, who tried the line herself briefly, has an excellent summary analytic overview and emphasizes White's weakness on the dark squares (including f2), arguing that should be the basis of Black's strategy. She notes that if Black players want to just have a solid game rather than challenging White, then 3...e6 and 3...g6 are good alternatives. Chapter 10 - Panov's Little Brother: 2. c4. It's good that Houska devotes an entire chapter to this line, which can be reached from multiple transpositional possibilities and can itself transpose into a full-fledged Panov-Botvinnik Attack. Black can't simply ignore the unusual move and should be prepared for it. Houska treats the main line approach, which after the pawn exchanges on d5 is to play 4...Nf6 rather than immediately recapturing with 4...Qxd5, which is reminiscent of the Center Counter defense. Chapter 11 - Two Knights Variation. This has always been at least somewhat popular at the Class level, I think largely because it's an obvious piece development. Also probably because White gets some cheap points after unwary Black players try to treat it like the Classical Caro-Kann and exchange on e4 followed by 4...Bf5? !, which gets punished every time by White (per the above link). The standard antidote (covered by Houska) is 3...Bg4, which is good for Black if the positional ideas behind it are understood (maintain the light-square bind with the pawns, don't open the position further). It's again worth noting the quality job Houska does of explaining the key ideas and plans, rather than giving a variation or two with a one-sentence comment. Chapter 12 - King's Indian Attack. (Yet another Fischer sideline in the Caro-Kann.) A more common setup against the French or Sicilian (as illustrated in the above link), it can also be used against the Caro-Kann. Black has nothing to fear, in this case having a couple of advantages (already having the d5/c6 pawn chain and the move ...e5 available early) and so equalizing rather quickly, has been my experience. Both the KIA and the Caro-Kann are solid openings, so there are few fireworks and the middlegame tends to be one of slow maneuvering rather than breakthroughs. If you play the KIA as White in other openings and don't want to learn something new against the Caro-Kann, it's certainly a practical option. Houska devotes a full chapter to it and a number of variations that are unlikely to appear on the board, mainly White deviations from the 5. g3 setup, so it may be more valuable in practical terms for White players looking for alternatives. Chapter 13 - Unusual Lines and the Plain Bizarre. The most important/relevant line here I think is 2. f4, which Black meets by playing in the style of the Advance Variation (with 3...Bf5) but I've also seen in practice the line 2. Nf3 d5 3. exd5 cxd5 4. Ne5, which has been used by some top Grandmasters for surprise value. My question is what are your results with this opening? Do you get easy to play positions? Do you use this opening much? I've used the Caro-Kann for my entire tournament career and have had (and still have) good results. The resulting positions (semi-open mostly) are comfortable for me to play, and the more I study it the more dynamic possibilities I find.